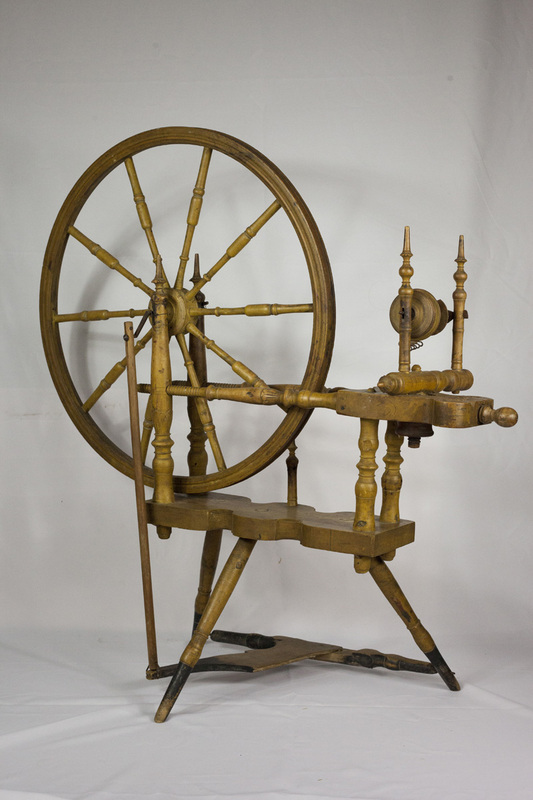 Museum records are silent regarding the identity of the original owner of this spinning wheel. However, the carved acanthus ornamentation and particular configuration of the spinning wheel’s components signal its Norwegian origins. The most likely scenario is that it belonged to a Norwegian woman who selected it as one of the handful of possessions she brought with her when she emigrated. Other possibilities are that a woman, likely a Norwegian immigrant, purchased the spinning wheel from a Norwegian craftsman in the United States or even from a company that imported spinning wheels from Norway. The piece probably dates to the mid nineteenth century. Though infrequently used for decorating spinning wheels, the acanthus carving establishes the Norwegian character of this piece. Acanthus is a spinney-leafed plant that grows around the Mediterranean Sea. Since Antiquity, motifs based on acanthus leaves have been popular throughout Europe. The Norwegian tradition of acanthus carving has its roots in the Baroque and Rococo styles. These styles, emphasizing curvilinear design and heavily carved surfaces, came to prominence in England and France in the seventeenth and eighteenth centuries. In the first half of the eighteenth century these styles spread to Norway through port cities like Oslo and Bergen. Furniture in the Baroque and Rococo styles became popular among Norway’s noble and merchant classes. From the affluent port cities, these designs spread to the rest of the country through decoration adorning parish churches. Rural craftsmen incorporated the acanthus designs when making furniture and other wooden items. As the acanthus style spread and was reproduced throughout Norway’s isolated valleys, it took on new attributes distinct from its Continental counterparts. Norwegian acanthus carving tends to have rounder shapes departing from the more naturalistic sharpness of the leaves that continued in European design. This gives Norwegian acanthus design softer appearance. Norwegian carvers also incorporated flowers into their interpretation of the acanthus mode. Examples of this can be seen on the fineals of the turned sections of this spinning wheel which are carved into blossoms. While the carvings on this spinning wheel are unpainted, Norwegian acanthus carvings were often painted in bold colors. Examples exist with leaves painted in a combination of sky blue, maroon, and gilt gold; this effect is unlike any use of the motif in other parts of Europe. While decoration on the level of acanthus carving was rare for spinning wheels, it’s presence on this piece illustrates the importance of this object to the woman who owned it. Spinning wheels stand apart from most other domestic items as the objects of exclusively women’s use. During the nineteenth century, women in rural Norway produced the majority of textiles and garments used by the household. Women not only spun yarn and wove it into fabric, they also were involved in both tending and shearing the sheep, producing the fibers to be transformed into yarn. Textile production was essential to home economy and a fundamental part of feminine gender roles in Norwegian culture. When Norwegians immigrated to America, spinning and weaving continued to be critical to the family livelihood. Letters immigrants sent back to friends and family in Norway who were considering immigrating themselves often advised women to bring their spinning wheels with them. While factory-made yarns and textiles were available in much of the United States, they were still often less available on the frontier. Additionally, many Norwegian women considered the mass-produced yarn to be of inferior quality and not capable of keeping their families warm. By producing their own thread and textiles, immigrant women were able to contribute financially to their households. By continuing Norwegian gender roles in caring for their own sheep, Norwegian immigrant women possessed a greater degree of financial autonomy than their Anglo-American counterparts. Hagen, Håvard. “Cartilage Baroque.” Store norske leksikon. https://snl.no/bruskbarokk (accessed May 23, 2017).